Fall 2018 menswear is all about corduroy, rollneck tops, and hiker chic. I always chuckle when fashion marketers try their hardest to repackage the same set of themes and trends anew each season. Year after year, fall and winter require more layers of warmth, and in the spring and summer, we embrace better weather, brighter colors, and things like shorts. The seasonal cycle has never changed, and yet for the sake of the economy, designers, brands, and retailers must introduce with fresh enthusiasm the amazing sweaters of this season. In reality, the coats, jackets, cardigans, and pullovers from years past will all work just fine, given they weren’t too trendy then and still look polished and fit well. I went for years without a proper cold weather wardrobe, but caught myself up living in Italy, surrounded by good quality and classic shapes. So while there’s nothing really new, there are some themes I’m enjoying this season that are perennial to the fall and winter, but stand out as relatively fresh and novel. Plus, one that is truly different. From Tom Ford to Fear of God, this fall is flush with corduroy. I have always liked the fabric. It’s plush, inherently warm, and adds texture but isn’t completely void of luster. Essentially a ribbed form of velvet, but mostly made from 100% cotton rather than synthetics. As technical fabrics, performance wear, and futuristic styles are trending, this material is a classic sartorial throwback. It’s best worn on crisp fall days or at home when the weather turns. Just be sure it’s not rumply or wrinkled. That will kill the elegant feel. Also known as turtlenecks. Who needs a scarf when you’ve got a cozy little cowl neck protecting your gola? I like that the rollneck tops this season aren’t too bulky, because they’re added onto t-shirts or made from fine, slimmed-down knits. Wear these as a base layer to almost any ensemble or under any outerwear. For most of us, hiking outdoors isn’t a daily pleasure, but one we have to plan and travel to access, as city dwellers. But that doesn’t mean you can’t werk that lewk with hiking-inspired (and hiking-appropriate if it comes to that) pieces. I especially like the rugged footwear that says “I’m nearly a lumberjack!” that will doubly suit the cold, wet, snowy conditions of urban streets and keep those feet dry and warm. A ridged sole and ankle covering are key to the hiker chic footwear look. And I would avoid suede if your fall and winter are particularly wet. Calvin Klein (no longer eponymous, now designed by Raf Simons) did it first, and a handful of others have rapidly coopted this strange trend. As a lifelong lover of firetrucks, I am drawn to the look, but ultimately imagine it (a) is hard to match with much of anything, except of course for the coordinating trousers and boots, and (b) won’t age well. Plus, it’s massively expensive, and thus a fleeting trend few will buy into anyway. From Raf/CK, there’s also a jumpsuit (Farfetch) and light brown (vs. black) version of the coat (Lane Crawford). I do like the details, however unwearable they may be. I also noticed some others that they didn’t mention doing the same sort of thing, including Junya Watanabe / Comme des Garçons / Canada Goose, and Heron Preston. Frankly, all of those looks scream “Road Work Ahead,” so it’s a pass for me. What I won’t pass on is channeling my best fall self with bold corduroy in rich earthy shades, a refined turtleneck t-shirt or sweater, or remaking myself into an urban hiker with some rugged boots. In San Francisco, urban hiking is the norm, with plentiful green space and the daily necessity of traversing steep grades, albeit on concrete rather than dirt and leaves. 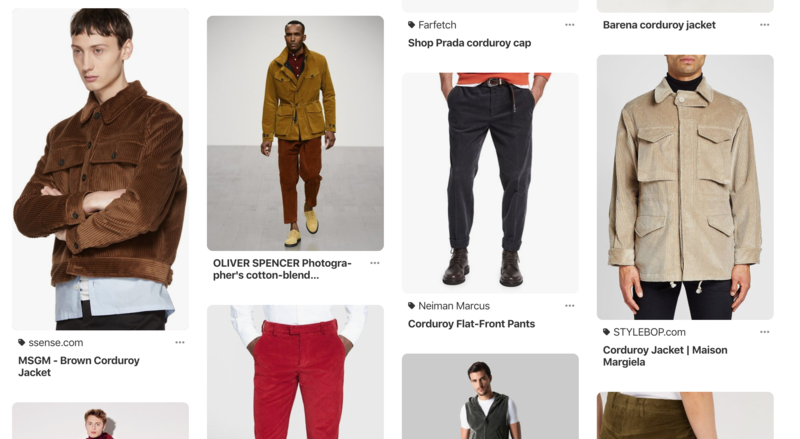 For other Fall 2018 Menswear ideas, check my Pinterest board. My recommendation, as always, is to buy the best quality you can afford, and keep garments for more than a season or two. Take care of them, but wear and enjoy them. Given a finite budget, choose one or two “trends” you love, that mesh well with what you already have, and then go for it!